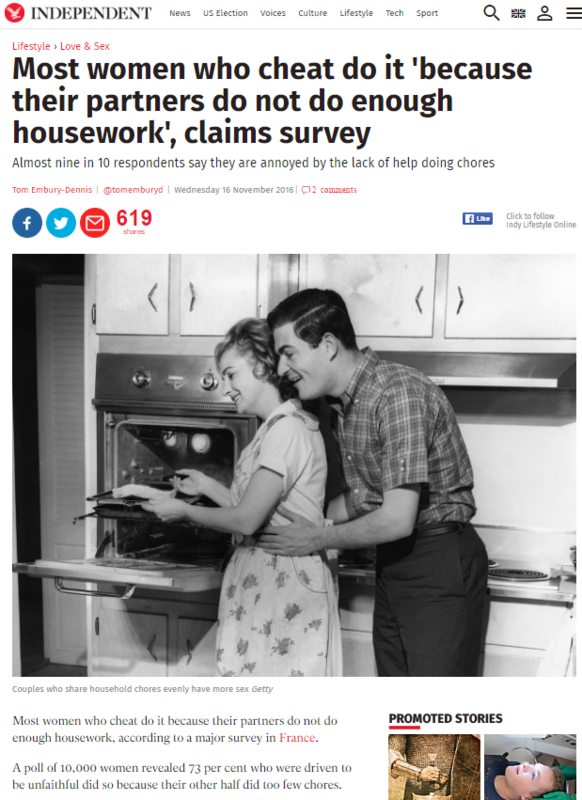 A poll of 10,000 female subscribers to Gleedon – a top site for married and unfaithful people – suggests that the best way to a woman’s heart is by doing the dishes and the vacuum cleaning. Most women who cheat do it because their partners do not do enough housework, according to a major survey in France. A poll of 10,000 women revealed 73 per cent who were driven to be unfaithful did so because their other half did too few chores. 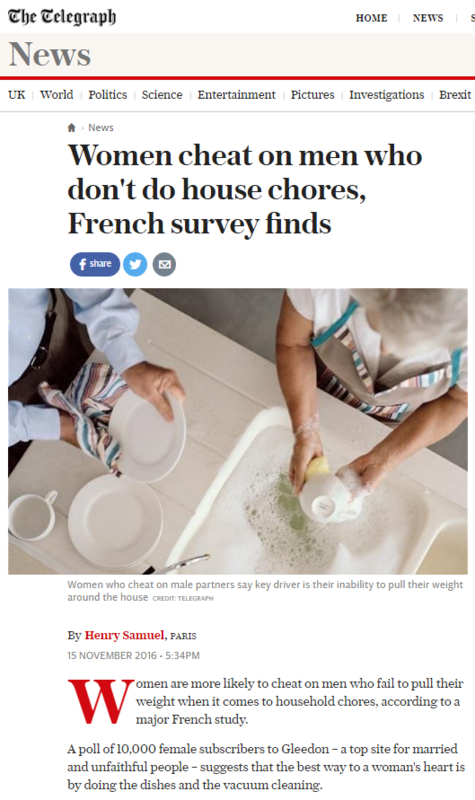 Women cheat on men because men don’t help them with the housework, according to this story which drifted into the UK press from the continent. At least the majority of the coverage of this tale put front and centre the source of the dubious data: Gleedon. Coming straight out of the Ashley Madison school of extramarital ‘dating’, Gleedon apparently polled 10,000 of its female users to find out what made them unfaithful. That said, that they claim to have 10,000 female users puts them out of the Ashley Madison school, the latter allegedly inventing many of its female users as a lure for the many male subscribers. How much can we trust the data shouted at us from these headlines? About as far as you can trust a website whose entire PR strategy relies on sensationalism and shock value, so not very far at all. This entry was posted in Gleedon on November 27, 2016 by Michael Marshall.